Since helping our Czech friend BobAsh get a Malaise Corvette from California to his homeland was so easy, I agreed to keep an eye open for a nice Crown Victoria Police Interceptor for him. After all, roaring through the streets of Prague in a genuine California cop car would be almost as much fun as roaring through the streets of San Francisco in a genuine Tatra 603. Last weekend I stopped by the auction yard at which I bought my Crown Vic a few years back, and found that the inventory included quite a few early 70s Ford Thunderbirds. 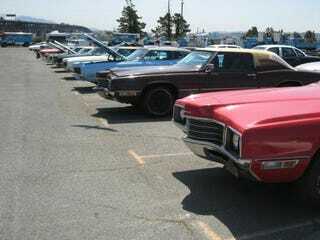 In fact, the inventory was almost entirely 1970 and 1971 T-Birds. Make the jump for more photos and the rest of the story. It turns out that I was looking at the estate of a recently deceased collector of '70 and '71 Thunderbirds, with at least 35 examples going under the auctioneer's gavel. Some two-doors, some suicide-doors, all with 429 engines... and every one of them had been sitting for at least a decade. Several were in great shape, several were hideous beaters, most had pretty good interiors, and many had fresh, if cheap, paint jobs. Many 8-track players. Most could be made to start and run (after a fashion), but it was clear that fuel systems, transmissions, and brakes had all felt the impact of a decade or more of inactivity and major sweat and money would need to be invested to get any of these cars into driving shape. Still, I was tempted to pick one up for a personal Hell Project, especially after it became clear that the ratty ones were going for $300 and the nicest ones were fetching under two grand. However, cowardice reason had the final word and I left in a T-Bird-less condition.